The H.D. Stud Line is our Heavy-Duty Industrial Stud & Track System that can be customized to meet a wide variety of Production Applications. The system features our Programmable Coil Feed Pre-Punch and Cut-Off with a direct feed into our unique Variable Head Rollformer. All systems are designed with heavy-duty hydraulic Punch and Cut-Off Presses using a programmable controller to produce a wide variety of length and punch variables. 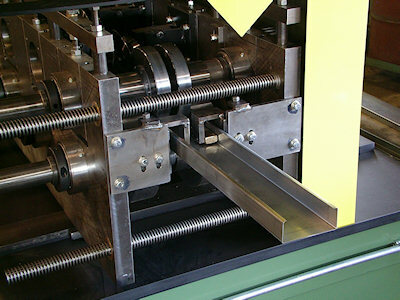 The Variable Head Rollformer positions the roll tooling with a simple handwheel leadscrew. This provides a quick-change setting and an infinite range to change Stud and Track widths. All Rollformers have precision-machined bearing housings and ground spindles using quality heavy-duty Timken roller bearings. Rolls and Dies are manufactured from quality high carbon / high chrome tool steel and heat-treated for years of dependable maintenance free service. The H.D. Stud Line was developed by Custom Rollform Products as an Economical System to manufacture Stud and Track on a just-in-time basis. It offers the latest concepts in quick-change setups that allow you to convert from Stud to Track in less than a minute. This allows manufacturers of Pre-fabricated Housings and Major Contractors to produce cut-to-length sections On-time and as needed without hours of Set-ups, Coil Changes and Excessive Scrap Loss. The main feature that really makes this system great is our Variable Head Rollformer that positions the roll tooling with simple leadscrew handwheel in less than a minute. 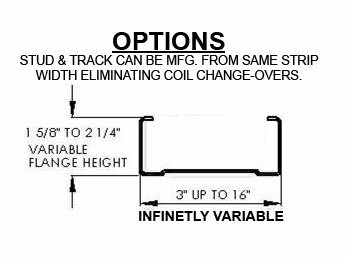 We’ve designed optional features that eliminates a coil changeover between Stud and Track which is a real time saver. This allows you to run and/or bundle everything (Stud and Track) as needed for a wall or section on a just-in-time basis. Other options include variable flange heights up to 2 ¼” and stud width variables up to 16” wide. The Direct Feed Programmable Pre-Punch and Cutoff feature eliminates die changeovers and produces a cleaner end condition on the studs. The Pre-Cut System also Eliminates all the Downtime and Scrap Loss when changing from Stud to Track. 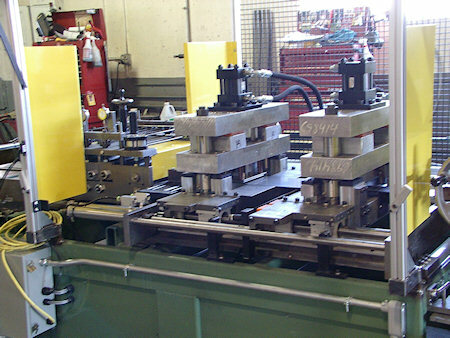 Multiple Punch Press/Dies can be added to increase line speed and production output. The H.D. Stud System features our Programmable Microprocess Length Batch Controller to Sequence the Hole Punch and Cutoff Press/Die. Feed Length and hole patterns can directly be keyboard entered and stored in memory. 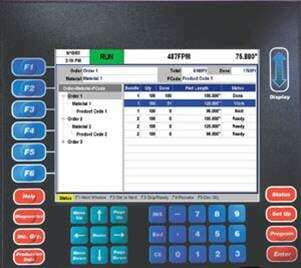 System adapts to add label printing or ink jet application. With optional software Keymark’s Key Build or Argos Systems can be added to develop and download production parts directly from architectural plans. The system can also schedule, and monitor daily production, downtime and material reports directly from an office computer. The main objective to manufacturing your own Stud & Track System is to Eliminate Manufacturing Costs, Inventories and Scrap Loss and to produce studs to size on a Just-in-time basis. All our Stud Lines feature quality Punch and Cutoff Dies, All Gear Drives, Heavy-Duty Spindles and Bearing and Full Hardened Rolls to assure years of maintenance free service. The H.D. 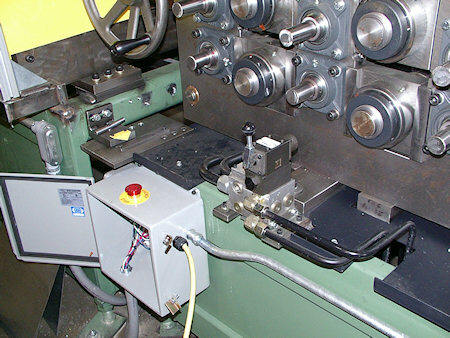 Stud uses a Programmable Pre-Punch, Pre-Cut System along with a Variable Head Rollformer. The Programmable Pre-Cut System produces a better cutoff end condition and eliminates die changes and Stud to Track changeovers. The H.D. 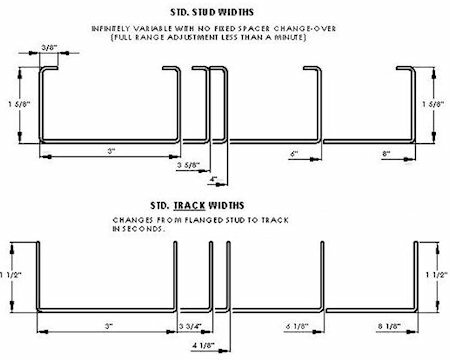 Stud Line was designed to Eliminate all the Extensive Setups and Changeovers and to Maximize you overall Stud & Track Production. Eliminating the coil changeover from Stud to Track is a real time saver and allows you to run and/or bundle everything needed for a wall or section on a just-in-time basis.